Making cheap jokes about modern art since 1989 I’m sorry. So anyway, my life has recently been revolving around research paper writing, and that’s why there was no comic last week. So, I tried to draw my comic this week using Clip Studio Paint’s comic tools, and I think that plus the fact that I drew a stupid Kingdom Hearts comic made this comic come out looking extremely meme-like, and I simultaneous love and hate it. Please bear with me while I figure out how to use these tools haha. Anyway, anyone else enjoying Kingdom Hearts 3 so far? I haven’t played any of the games since Chain of Memories, and I can’t figure out if the dialogue for KH3 is more awkward than in the other games I’ve played, or if I was just better in middle school at suspending disbelief about Disney characters saying the ridiculous things they do. 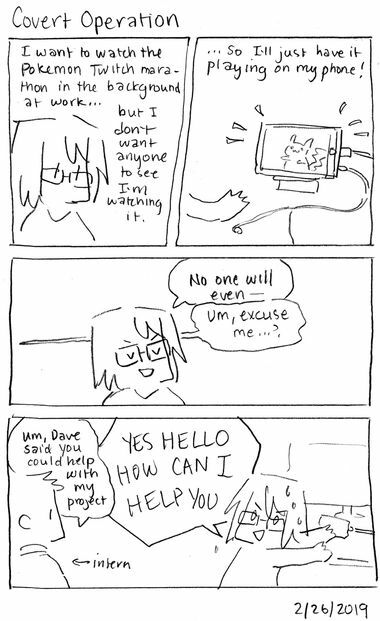 My hourly comics from Hourly Comics Day last month! I worked from home today and literally only talked to one other human being so I feel like this year’s comic was a little boring! I’ll try to be funnier next year haha. I should probably try and get a desk that, you know, faces a wall or something. After a couple of weeks, we finally said goodbye to the kitties. Our opinions on cats were changed forever. Why? 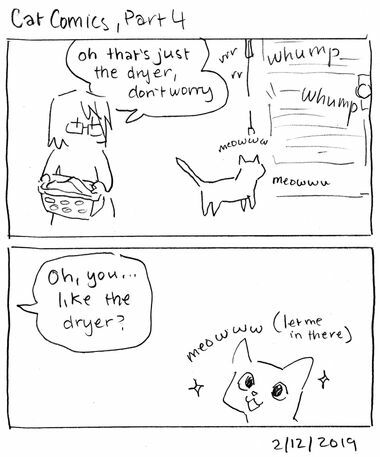 Why do you like the dryer?? What do you think is in there?? ?